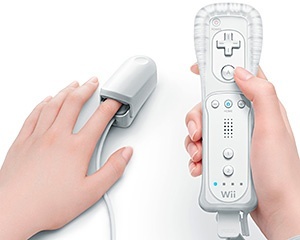 According to Nintendo, E3 was the wrong time and the wrong place to reveal the Vitality Sensor. If you watched Nintendo's E3 presentation and wondered where the Vitality Sensor was, don't worry, it hasn't gone away; Nintendo just didn't think that E3 was the right venue to showcase it. "We're continuing to work on the Vitality Sensor. As we thought about what we wanted to bring to E3, we realized we had a really packed agenda," said Nintendo's senior vice president of sales and marketing Cammie Dunaway. "We also thought about the atmosphere at E3 which is noisy and adrenaline-filled, and loud and stressful, and it just didn't seem like the best environment to introduce a product that's really about relaxing, so we decided we'd think about other venues that would be more appropriate." It's true that Nintendo's conference was pretty jam-packed, and with the company showing off a ton of new games, including the new Zelda and the Goldeneye remake, not to mention the 3DS, bringing out a piece of hardware that is basically a heart monitor might have been a slightly awkward tonal shift. Dunaway's comments do give a possible insight into what Nintendo has planned for the device however, and it doesn't appear that it's really aimed at core gamers. I'm guessing that what Nintendo has in the pipeline is something like Innergy, a game about relaxation that Ubisoft announced at its E3 press conference, but we'll have to wait to see if that is actually the case.